According to the last words of his mentor, friend, and political opponent, John Adams, “Jefferson lives.” Jefferson and Adams both died on the same day, July 4th, 1826 – 50 years to the day from the approval of the Declaration of Independence. Nevertheless, these men maintain a presence in our culture and our media to this very day. We’re surrounded by history all the time, particularly here in Virginia. Modern people draw from the past and interpret it from their own contemporary perspectives. Scholars and historians delve into the esoteric details of historical events and figures from an academic point of view. However, modern-day tourists go on guided tours through their homes and properties, trying to get a sense of what life was like during those historical times. Nevertheless, it is always difficult to truly view the world through their eyes, no matter how hard we try. For the last 30 years, I have attempted to offer my interpretation of how Thomas Jefferson saw the world, and to convey that message to those who have an interest in American History. Now, thanks to Phil Jaderborg from PJ Networks (and a former student that I counseled in high school), I am continuing this effort in a 21st Century medium. I hope the be blogging regularly in the future, and if you are interested in any of the topics or articles that I present to you, I encourage you to contact me via the contact form at the bottom of my website. Also, please feel free to share any of my posts or the link to my website with friends and family members who may share a similar interest. Posted in Jefferson Quotes, Jefferson Reenactor, Thomas Jefferson, Tom Pitz | Comments Off on Is Mr. Jefferson Dead? Sign Up For Mr. Jefferson’s Postings! 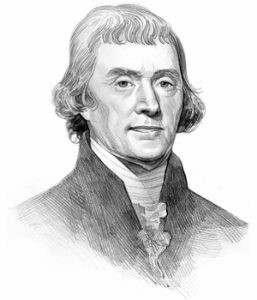 Receive a notification whenever Mr. Jefferson makes his writings available to the public.